Calvin Johnson is of the best wide receivers to ever play the game of American Professional Football. In 2012 he set a record for single season receiving yards eclipsing the great Jerry Rice. Earlier that same year he signed an eight year, $132 million contract extension with the Detroit Lions - one of the World's most lucrative. In the image above Johnson is seen speaking on a mobile phone - a setting in which a lot of key body language tells can be gleaned. As a conversation changes throughout the duration of a phone call, it is extremely useful to monitor the relative alpha-to-beta flux throughout the call. There are many nonverbal signals which will point the way here - one of which is the position of the index finger (aka forefinger) and is particularly more prominent in men. 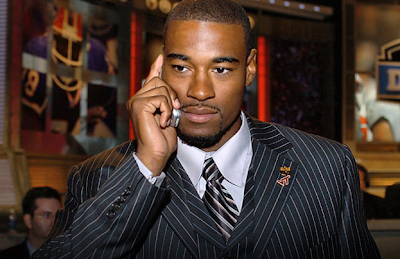 When it is extended and alone, along the back of the cell phone (in contrast to the other fingers flexed and on the phone's side as Calvin Johnson is shown in this photo) - it is a considerable alpha signal. Subsequently it often will be seen flexing - and joining the other fingers when the context of the phone call takes on a more beta/bad news/submissive emotional tone. Later, when once again a more dominant or joyful context takes a more prominent role, the forefinger will then re-extend. This nonverbal tell is an extremely reliable signal and yields golden insight within any type of negotiation or sales setting. Happy birthday Calvin. Good luck against the Bears.